The #1 study guide for the leading HR certification, aligned with the updated HRBoK™! 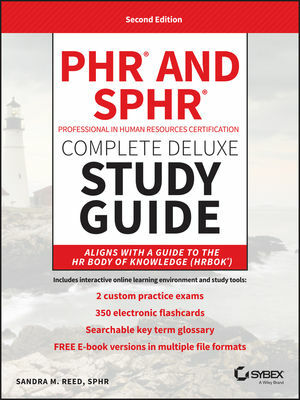 PHR/SPHR Professional in Human Resources Certification Deluxe Study Guide, Second Edition, is the ideal resource for HR professionals seeking to validate their skills and knowledge acquired through years of practical experience, or a relative newcomer to the HR field looking to strengthen their resume. Featuring study tools designed to reinforce understanding of key functional areas, it’s the study guide you’ll turn to again and again as you prepare for this challenging exam. Offering insights into those areas of knowledge and practices specific and necessary to human resource management (HRM), this study guide covers tasks, processes, and strategies as detailed in the updated A Guide to the Human Resource Body of Knowledge™ (HRBoK™). The study guide breaks down the critical HR topics that you need to understand as you prepare for the exams. You’ll get a year of FREE access to the interactive online learning environment and test bank, including an assessment test, chapter tests, practice exams, electronic flashcards, and a glossary of key terms. New bonus material includes study checklists and worksheets to supplement your exam preparation, and eBooks in different formats to read on multiple devices. 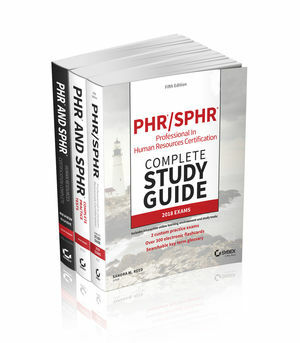 If you're looking to showcase your skills and understanding of the HR function, PHR/SPHR Professionals in Human Resources Certification Deluxe Study Guide is your ideal resource for PHR/SPHR preparation. Sandra M. Reed, SPHR, has over 20 years of HR experience, the last 10 in the consulting and teaching arena. She currently is owner of Epoch Resources, a consulting firm located in the Central Valley of California, which specializes in the unique HR needs of small businesses. She has conducted onsite training for California State University, Stanislaus, University of the Pacific, the Small Business Development Center of Stanislaus County, and private employers throughout Northern California. She is the author of PHR and SPHR Professional in Human Resources Certification Complete Study Guide, Fifth Edition.